Bow and Arrow in hand, the young huntress bursts through the brush chasing her prey through the forest. She'd been tracking the deer for days and needed the food for her family. She knocks the arrow while on the run and fires through the air, Will it hit? It's up to you! Need a different scenario? Young Artemis, the Goddess of the hunt is off to find her band of (girls only) hunters throughout the forest. What mythical creature would they hunt next? A giant boar? A great lion? How about another plot? A revolutionary armed with her signature weapon and a goal to overthrow the tyrannical government. The future is in your hands, young warrior! 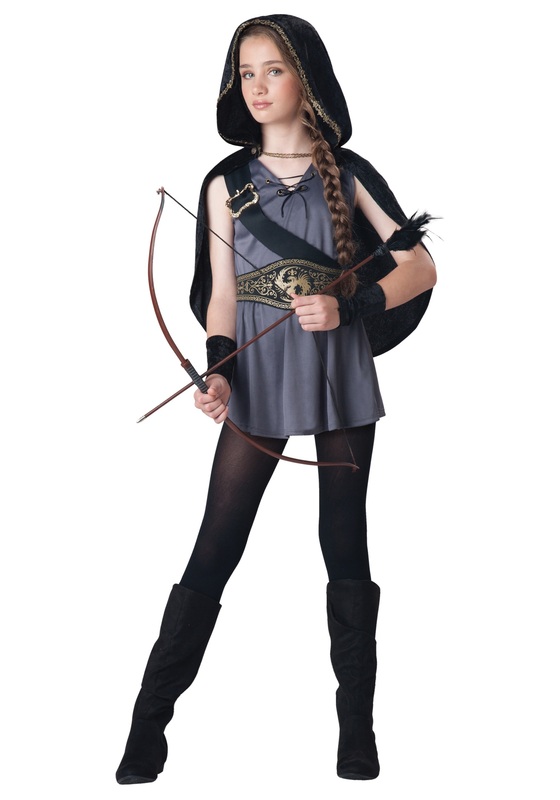 Grab your bow and arrows to wear this Girls Hooded Huntress Costume this Halloween. The huntress costume will get your child prepared for anything that comes their way. The gray interlock sleeveless tunic has an elastic waist and laced front placket for added detail. The faux suede shoulder sash and belt fasten with Velcro for a unique and versatile look. The crushed velvet cape and matching wrist cuffs take this costume to a sharpshooter level. Be sure to grab a pair of your sturdiest shoes before you run out to your next adventure. You never know what you'll encounter! You can run through a mythical forest, pretend you’re a powerful Greek Goddess, or create the spark that makes a revolution catch fire! The choice is only limited by your imagination and if you're anything like us, you love to let it run wild! Don't forget to grab yourself a bow that fits your personality. We do have a pretty awesome selection of them and that's the defining feature of your outfit, young huntress!